Deep fried foods are delicious but cooking these foods can be hazardous if it is not done correctly. With hot oil and grease reaching temperatures up to 400 degrees Fahrenheit, safety is important. Grease and oil popping out of the fryer when food is submerged in the fryer can result in nasty burns for the operator. Smart Care Equipment Solutions is here to provide you with some helpful safety tips when using a fryer in a commercial kitchen. As with any piece of cooking equipment, there are tips and recommendations to help keep the operator out of harm’s way. Commercial deep fryers operate at very high temperatures, and the deep fryer oil can cause severe burns. Floor mats – something that sounds so simple can help prevent slippery floors. Since a fryer tends to splash oils out, having non-slip floor mats in place can help prevent falls. Footwear – as with the mats, wearing non-slip shoes can help keep you on your feet. Safety equipment – when using a fryer, a class K fire extinguisher should always be within reach, and pot holders, steam resistant gloves, or oven mitts should be used when changing the hot grease. Storage – every kitchen needs storage. When you have a fryer in your kitchen, you should keep frequently used items stored away from the fryers. This will help prevent someone from getting burnt when they are trying to access needed items. Clean safely – deep fryer cleaning is a must. You should always perform fryer cleaning first thing in the morning when the oil in the fryer tank is cool. Training – anyone who is going to be operating the fryer should be trained on proper use and safety. Anyone in the kitchen should also be trained in basic first aid skills. This way if an accident occurs anyone around will be able to help the person who is injured. Quality – all oils and fryers should be of high quality to help avoid unnecessary accidents. Since they use many quarts of oil on a regular basis, having the best quality oil is vital. Canola oil is less likely to splash and is considered a higher quality oil. Things such as grease disposal systems, splash guards, a vent hood and proper ventilation, vat covers, a thermostat, frying basket, and grease filters should all be of good quality. Tongs – long tongs should be used to remove foods. Doing this can help prevent the operator from being splashed with the hot contents of the deep fryer. Overfilling – you should not overload the fryer. This can cause erratic grease splashing, making things more dangerous. Just as you should not overfill the fryer with food, you should only fill the fryer with grease or oil to the fill line, having excess oil in the fryer is an accident waiting to happen. 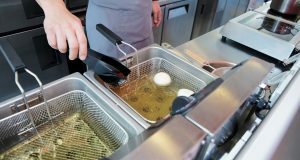 Dropping – when you are dropping batches of food into the fryer the fry baskets should be lowered into the grease or oil slowly. Quickly dropping food can cause more popping of the grease resulting in burns. Drink free zone – you should not have any drinks near the fryer. If water or another liquid or ice accidentally falls into the hot oil, it can cause the fryer oil to violently react. Liquid will flash and expand as it converts to steam. Fire – you should not have your fryer set up near an open flame. This puts your kitchen at high risk for a grease fire. At Smart Care Equipment Solutions, we understand how well loved deep-fried foods, like onion rings and fries, can be. With electric fryers and deep fat fryers operating at such a high temperature, knowing how to handle these pieces of equipment is essential for kitchen safety. Whether it be safety tips, preventive maintenance, or equipment repair, we are here to help!